The Seven Years War was my idea for a new period which I decided to try in the autumn of 2007. Inspired by the ads and articles I saw in Battlegames magazine, I decided it was time to try some Old School wargaming. Therefore, my first idea was to use Spencer Smith figures and take a look at both Peter Young's Charge! and Wargames by Charles Grant. Unfortunately, I soon realised that the Spencer Smiths presented too much of a challenge if I was to create something like the figures I saw on the company website. I also found that, whilst I enjoyed the books as nostalgia, the Grant/Young rules were not to my taste, in particular due to the size of units. However, I was directed to the RSM range of figures by advice on the Old School Wargaming Yahoo group, and found these just what I wanted. They had an elegant Old School feel but were well cast, had lots of detail to guide the painter, and were no more expensive than the Spencer Smiths. They had to be ordered from the US, but the favourable exchange rate was an advantage here. The range is also quite extensive. Infantry Regt 10, Jung Wolfenbuttel, 2 battalions, each of 24 figures. Infantry Regt 37 (Hungarian), Josef Esterhazy, 2 battalions, one of 20 figures, the other of 16 figures. Cuirassier Regt 10, Stampach, 1 unit of 8 figures. Cuirassier Regt 12, Serbelloni, as above. Dragoon Regt 6, Liechtenstein, as above. Dragoon Regt 37, Kolowrat, as above. 2 x 6 pounder guns, 3 crew each. 1 General figure with standard bearer. Infantry Regt 1, von Winterfeldt, 2 battalions, one of 16 figures, the other of 20 figures. Fusilier Regt 33, de la Motte, 2 battalions as above. Cuirassier Regt 3, Leib zu Pferde, 1 unit of 8 figures. Cuirassier Regt 8, von Rochow, as above. Dragoon Regt 6, Schorlemmer, as above. Dragoon Regt 9, Herzog George, as above. Guns and Command figures as per Austrians. I never felt any desire to create one of the 'imagi-nations' which seem so popular at the moment. They seem to be a source of great enthusiasm and fun for those concerned, but to be blunt I fail to see the point. The real historical armies are so much more interesting than anything you could make up. The painted figures from DPC come as already formed units, so you have to take what is available, up to a point. The cavalry came as units of 15 figures, so in each case I bought an extra figure, found a second regiment with a similar uniform and made the minimum alterations to create a second unit, converting a standard bearer for each of the new units. Standards were printed off from online sources. After much searching and dithering, I had come across the Minden Rose rule set after contacting the author, Barry Lee, more or less by coincidence when he posted online for opponents - he lives about 40 minutes from me. These rules operate at the multi-brigade level, but brigades can be of 2-6 battalions so my infantry regiments could be brigades as far as the rules were concerned. Cavalry brigades would be of 2 regiments each. I therefore had 4 'manouevre units' per side (plus my guns which count as independent) from the word go. Early games were great fun and I had no hesitation in sticking with the rules I had chosen. The figures were finished in a pleasing block-painted style which was easy to copy and had a good old school look, so I set to work increasing my army by painting my own figures. I soon found artillery under Minden Rose is supposed to be of units of at least 3 guns to be properly effective, and preferably 4 if medium, so new guns were acquired and painted, along with limbers for all weapons. I like the look of limbers on the table and they serve to represent the large number of horses and support wagons needed by an artillery unit. Two small light infantry battalions were created for the Austrians, each of 8 figures, painted with uniforms from the Liccaner and Szluiner regiments. Close order infantry battalions with only 16 figures were expanded to 20 figures as this is my preferred 'standard' size. Barry uses 16 figure battalions almost exclusively in his armies, but I prefer the look of the slightly bigger units. The rules allow for battalions of between 12 and 24 figures, based four to a base 40mm x 40mm for close order infantry. Cavalry are 2 to a base 50mm x 50mm, and light infantry 2 to a base 40mm x 40mm. 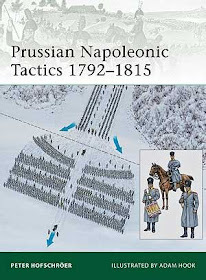 I use 8 figure cavalry units as these work well with the rules - and don't require me to paint too many cavalry figures! I am about to expand every other cavalry regiment to 10 figures to see how this works. I have also just received some dismounted dragoon figures from Outpost Wargame Services (there are no dismounted figures in the RSM range). I have ordered only 16, 8 per side, so that one dragoon regt per side may become dismounted. I intend to keep the command base mounted to avoid having to make new standards and buy new foot command figures. The Outpost figures come from their Highwaymen range, and are a little bulky next to my RSMs but about the same height. My first choice would have been the more correct figures from Wargames Foundry, but the high price of these latter figures put me off - with only 6 figures in a pack you are paying nearly £2 for an unpainted figure. However, my main project at the moment is painting up two grenadier regiments per side to significantly increase my infantry forces. These will be from the RSM range. Production of new units will be covered in future posts. A final side project is the use of rules by Donald Featherstone for the occasional Old School battle. I have made a few minor adaptions from the originals, and the result can be seen in the Featherstonian Rules post. Those of you with copies of Wargames might be interested to compare my set with the book. I find no problem in using the Don's rules with figures based up for Minden Rose - just a few minor tweaks required! I researched and wrote this book over a four year period in my spare time, purely as a hobby project but with the intention of seeing it published commercially. I had already obtained a Masters Degree in history at the Open University so I had some background in research skills and extended writing. I chose the subject after seeing an article in Tracklink, the magazine of the Friends of the Bovington Tank Museum. A lot of the research was done at Bovington, as well as the Museum of Army Flying and the Public Record Office at Kew. The book should be of interest to anyone curious about airborne forces in World War 2. The story is a unique one, and I think it fills a significant gap in the history of British airborne forces. 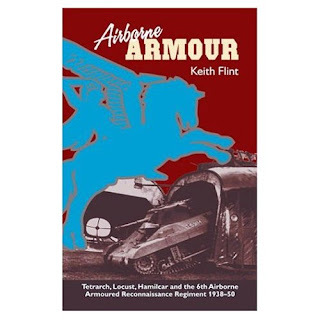 It provides a full development history of the Tetrarch and Locust tanks, and probably the fullest background to the development of the Hamilcar glider ever published. The text goes on to cover the operational use of the tanks and gliders in detail, from the Tetrarch's service in Madagascar, through D-Day and the Rhine Crossing to the end of the war. The book also provides the only accurate and full history of the 6th Airborne Armoured Reconnaissance Regiment, which operated the tanks and was the reconnaissance regiment for 6th Airborne Division. Readers will find the operational account supported by clear maps, and there are a number of new photos and illustrations which should be of interest to all airborne buffs. For example, there are rare stills of Locust tanks in action during the Rhine crossing, and drawings of an early Hamilcar concept. I have tried to provide all the background the reader might need to put Britain's 'flying tanks' in perspective, such as brief descriptions of the development of the Glider Pilot Regiment and the glider tugs themselves. I include a chapter on developments in this field in other countries such as Germany, the USA and Russia. In particular, the German Me321 Gigant glider is described and compared to the Hamilcar. I have tried throughout to make the book readable and accessible, whilst at the same time being thorough and accurate. For those (like me) who consider such things important, all sources are fully referenced throughout, and there is a full bibliography. The book is available online at Amazon.co.uk, and also via the publishers Helion and Company. If you decide to buy the book, I wish you happy reading! By the way, the colour scheme on the photo of the Tetrarch shown here is probably wrong. 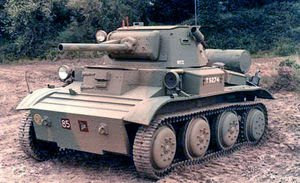 Photos indicate a two-colour scheme was in use, but was most probably the usual dark green - black pattern as seen on many British military vehicles at the time.